“It started out as something smaller, a Day of the Dead thing,” Henry Gonzalez explains, standing before the Memorial Wall at the South Austin Popular Culture Center on Lamar, “but it changed as people got into it.” He describes an afternoon when he felt the wall gained a life of its own, when it became something more than a personal project documenting the loss of key figures in the Austin scene. 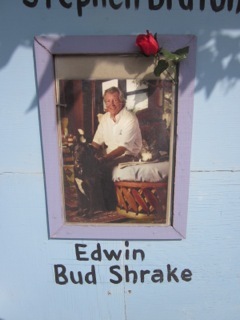 He was in the parking lot of the Planet K smoke shop that hosts the Center when he saw a pickup truck pull alongside one of the wall’s panels. Henry approached and noted that they were before the portrait of conjunto accordionist Camilo Cantu, who passed in 2007. Cantu’s nephew had been driving the truck, looking for a parking spot at Planet K when his passenger, Cantu’s widow, noticed the picture. “Why is my husband on the wall with all these gringos?” she asked Henry in Spanish. “It’s so we don’t forget,” he replied. She thanked him and began to cry. The “end of Austin” is, of course, a construct that captures only a very small portion of the city’s full history, privileging a moment in time and a fraction of Austin’s inhabitants. It tends to foreground a memory of Austin as enjoyable, quirky, progressive and born of the Sixties counterculture’s shaping of the Texas capital into a comfortable nest for the twenty-first century creative class. As the story goes, this shaping has perhaps made the place a bit too comfortable, a little too enticing, inviting growth that undermines Austin’s distinctive character. The city’s outsized sense of self feeds off these persistent declension narratives. If someone arrives to validate our much-hyped reputation and does not find the shangri-la she or he expects, Austin inhabitants can always say, “Well, you should have been here when . . . but that’s all gone now.” James McMurtry sang about it, capturing the experience of moving to town in the late 1980s on his debut album: “I’m not from here/But people tell me/It’s not like it used to be/They say I should have been here/back about ten years/before it got ruined by folks like me.” The celebrated Austin thus becomes a mirage always receding on the chronological horizon. James’s father Larry had called Austinites out on this sleight of hand in Atlantic Monthly back in the Golden Age of the 1970s itself: “If I were to choose one example of the Texas penchant for ludicrously overestimating local achievement, my example would certainly be the city of Austin.” Any project surrounding the “end of Austin” would be keen to follow the McMurtrys’ lead in revising, complicating, and nuancing how people talk about this place. I’m not going to take that tack here, though. In a decade of digging around in Austin history, of first researching and then getting to know some of the folks who authored and lived the master narrative that marched through the University of Texas to the Threadgill’s folksings to the Vulcan and the Armadillo and the Save Our Springs Alliance, I have come to advocate a post-revisionist position that continues to recognize the significance of Seventies Austin as a provocative cultural formation worthy of its reputation. This wall on South Lamar memorializes that formation as it passes from the scene, a colorful line of seventeen panels with three or four rows of photographic portraits along each square. Old friends leave trinkets, making the wall a constantly shifting collage of drawings, flowers, beers, toys, fifths of whiskey, costume jewelry, and love letters. It is the connectedness of these individuals that matters. These portraits do not simply represent important Austin personalities; they represent important Austin personalities who knew one another and worked together, played together, lived together, loved together in community. Armadillo and Threadgill’s proprietor Eddie Wilson theorizes that there must be some mathematical formula to determine when a city gets to a size that its people no longer know themselves with any kind of intimacy, when the bonds of families and debts and feuds and gifts do not stitch the place together as they once did. I fully recognize the romanticism of such a notion. I often criticize when others expound it. It seems to prize smallness over bigness, simplicity over complexity, and personal relations over the sophisticated systems of political economy. It seems to mistake our sizable city for a small town. Small towns can be supportive when everyone knows your affairs, but they can be stultifying for the same reasons. They can inspire loyalty and nurture community; they can aggravate prejudices and stifle dissent. But, I’m not sure that there isn’t something to the matter. In studying an earlier Austin, I’ve found this dense connectivity interesting, especially as it is demonstrated in the correspondence of the century’s midcentury regionalists Roy Bedichek, J. Frank Dobie, Walter Prescott Webb, and their associates. They would trade letters on the affairs of a local department store manager, or follow the performance of individual students for decades from their promising high school years through their entire professional careers. Such connections trace the notion of an Austin “scene,” a self-aware group of individuals connected one to another through experience, obligation, and shared history. The Memorial Wall renders this scene in photographic portraiture. Its visual focus fits its past, as both the wall and its neighboring exhibition space began as sites to remember the visual artists brought together by the South Austin venue the Armadillo World Headquarters in the 1970s. A group of the Armadillo artists, together with their friends and associates, founded the South Austin Popular Culture Center in 2004 with Leea Mechling as Director. It opened with a series of exhibitions highlighting artists such as Jim Franklin, Kerry Awn, Danny Garrett, Henry Gonzalez, Guy Juke, Bill Narum, Micael Priest, Sam Richardson, and Sam Yeates. 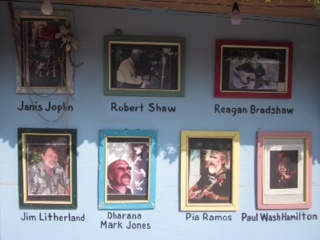 Many of these artists are still active in Austin. Others have passed on, moving over from the Center’s exhibition space to the Memorial Wall. Jack Jaxon is amongst the latter. The scene has multiple origins and origin stories, of course, and Jaxon might be one of those with a strong claim to being present at the creation. He penned what many consider to be the first underground comic—God Nose, distributed on the UT campus in 1964—and, as a confrere of Gilbert Shelton, founded Rip Off Press in San Francisco. Jaxon’s prodigal return to Austin after a California sojourn paralleled the experience of so many of his Austin generation. Back home, Jaxon not only fashioned his famed handbills for the Armadillo, but he also took an interest in Texas history, archival research, and cartography and, more recently, had published graphic novels on Quanah Parker and John Wesley Hardin before his death in 2006. Bill Narum is on the wall, too, one of the guiding spirits of the Center and a historian of Austin’s graphic arts dating back to the Republic. There’s Tony Bell, one of the first to fashion the armadillo as a Texas countercultural icon in the pages of UT’s humor magazine the Texas Ranger. And Ken Featherston. Featherson features prominently, and tragically, in the Armadillo story, a sort of early “end of Austin” in miniature, a moment when the scene began to recognize the boundaries of its idyllic rhetoric. He was a gentle young artist in the Armadillo crew who hailed from South Texas, as did his friends Henry Gonzalez and Leea Mechling. One night at the Armadillo in 1975, trouble erupted with some drunks who refused to follow house rules. The bouncers threw them out, where they waited to ambush any Armadillo employee who crossed their path. They gunned down Ken Featherston in the venue’s parking lot. The murder marked a turning point of sorts. By many accounts, the venue’s security guards became a bit surlier in its wake, and the place turned a little meaner, or at least impersonal. The old spirit carried forward, but not without some cracks in its façade. 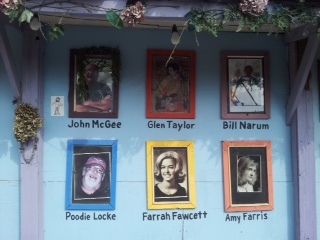 Authors, musicians, politicians, and others join the artists on the wall. 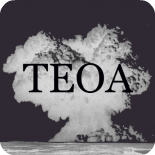 Edwin “Bud” Shrake, a writer who threads through any number of significant episodes in late twentieth century Texas history, is here. As a roving sports journalist and novelist, he’d had a hand in naming both the Armadillo World Headquarters and the Dallas Cowboys. He escorted Muhammad Ali through a riot in Houston and escorted Ann Richards during her inaugural ball. Governor Ann is here, too, having gotten her start as Travis County Commissioner at a time when she was spending many evenings with the Armadillo crowd. In another example of the dense connectivity of scene, Jan Reid, who wrote the recently-published Richards biography Let the People In (and who, incidentally, was advised to leave academia for journalism by William Goetzmann), is married to Dorothy Browne, one of Richards’ longest-serving aides. Browne had previously been married to Bill Brammer (author of the iconic Austin novel The Gay Place and another denizen of the wall). Brammer’s prior wife, Nadine, went on to marry liberal Houston congressman Bob Eckhardt, whose father had been a prominent German-Texan doctor in Austin in the early twentieth century. Eckhardt drew satirical cartoons for the Texas Ranger decades before Tony Bell took up his armadillo renderings there, or Jaxon started stapling the pink construction paper that formed the covers of his underground God Nose. Nightlife, popular music, literature, journalism, social activism, and formal politics formed a dense web in the Austin of the 1970s and 1980s. Former Austin Mayor Jeff Friedman, a veteran of the university’s antiwar politics, is on the wall, too, shown speaking to an audience at the Armadillo. By contrast, I’m not sure how many visits Lee Leffingwell has made to the Mohawk or Emo’s East. In creating the memorial, Henry Gonzalez attempts to render these connections visible and to make the case that the scene was an inclusive one. South Austin’s defining feature in the decade when the Armadillo nested here, after all, was that it was a working-class space shared by Anglos and Mexican Americans. The Chicano Movement in town coincided with the rise of the Armadillo generation but does not tend to figure as strongly in the city’s public mythos. Gonzalez hopes to change that—the Cantu story has that cast to it. 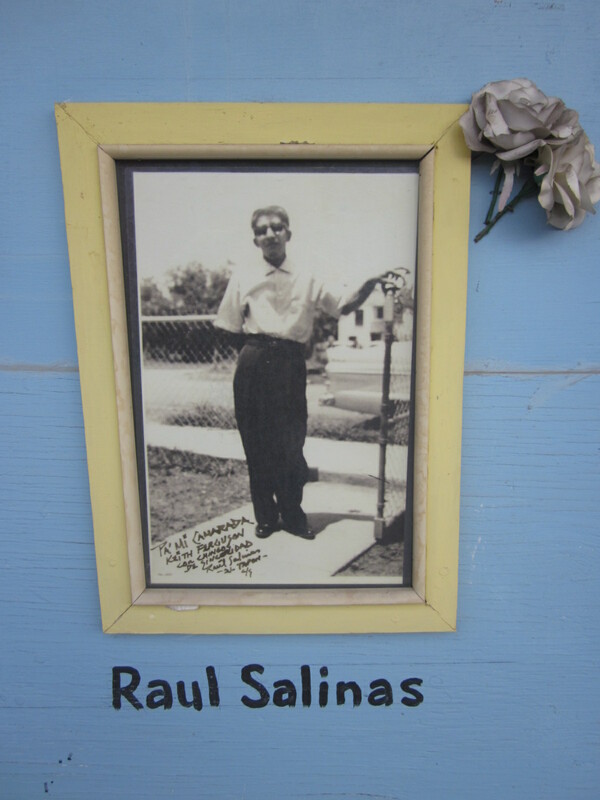 Raul Salinas, the radical Austin poet and a founder of Resistencia Books, adorns the wall in a picture signed and dedicated to a local musician. A strong contingent of conjunto accordionists appear in addition to Cantu, including Roy Montelongo and Tony de la Rosa. Selena is here. Not exactly an Austinite, perhaps, but she is absolutely an icon that speaks to the sense of loss the wall embodies—and serves as a tribute to Henry and Director Leea’s South Texas past. Contextualizing Austin’s African American community in these scene narratives is a trickier business, and more needs to be done on youth culture and race in the Seventies. My sense is that Anglo and Mexican American youth cultures spilled into one another in some nightlife venues, but only rarely was significant integration seen in terms of young black and white musical audiences. What the wall demonstrates, in any case, is that young Anglo and Mexican American musicians, audience members, and venues cultivated meaningful relationships with (primarily older) African American artists. Mance Lipscomb is perhaps the patron saint of this group, spending his last years in Austin before his death in 1976. Pinetop Perkins provides a later example. In the 1960s, Anglo fans coaxed barrelhouse pianist Robert Shaw out of retirement—or “retirement,” as he ran a successful market at the time in a building along Manor Road that now houses the Salty Sow. Folklorist Tary Owens perhaps found the convincing easier for the piano legend the Grey Ghost, who had spent many years as an Austin school bus driver. He now haunts the wall, too. Freddie King is there, a younger African American blues guitarist who spent a significant amount of time at the Armadillo, which he referred to as “The House that Freddie King Built.” I once saw an undergraduate UT class pepper Eddie Wilson with questions about all of the “old bluesmen” who played the Armadillo. After they had repeated the phrase several times, he replied, “Old bluesmen? Freddie King was in his thirties when he started playing there.” He was only in his early forties when he died in 1976, not that this age clarification would necessarily mean much to an eighteen year-old. The Jim Franklin painting of an armadillo exploding out of his chest that adorns the entryway of the Threadgill’s South location is not to be believed as a realistic depiction of his demise. Tragedies abound in the wall’s frozen images, perhaps invisible to the casual visitor but written deeply in the scene’s folklore. Singer-songwriter Blaze Foley is here, a troubled and talented figure often compared to Townes Van Zandt. He was gunned down while defending an elderly friend from an abusive son. Lucinda Williams’ song “Drunken Angel” recounts his legend. Marian Royal, coach Darrell’s daughter, appears in a photograph where she is cheerful, reclining, talking on the phone. Darrell Royal, the legendary UT football coach who passed away this year, had befriended Willie Nelson and was a progressive country fan, but he did not particularly take to the counterculture. His children Mack, Marian, and David, however, were another matter, finding common cause with their Austin peers. Tragedy struck when Marian died in a traffic accident in the early 1970s. A motorcycle accident took her brother David nine years later. 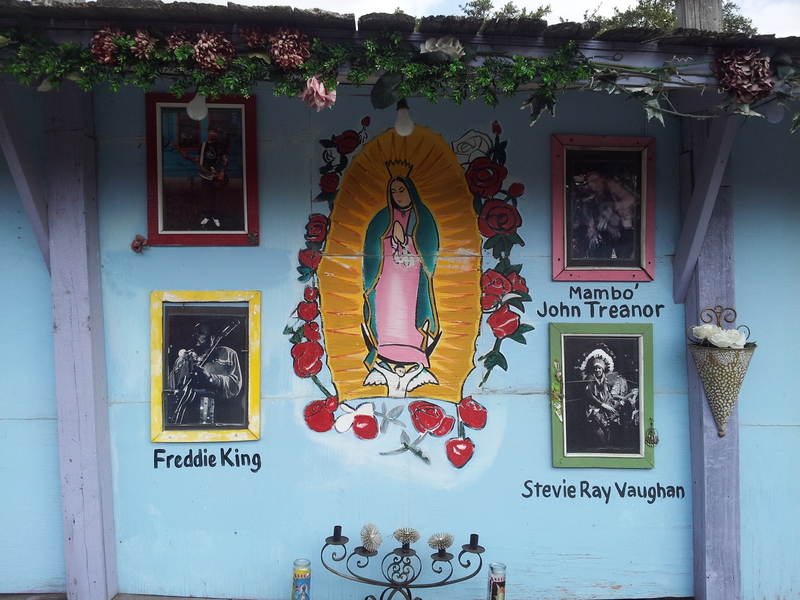 The Royals’ remaining son, Mack, became a talented scene photographer and has had his work exhibited at the South Austin Popular Culture Center, a pillar of the Armadillo community. But Blaze Foley and Marian Royal, and Janis Joplin and Ken Featherson, were the ones cut down too soon, the ones who appeared on the wall at its outset. Henry did not necessarily anticipate how rapidly the memorial would grow, though, as health and years caught up with the Armadillo scene. The next year’s series of wall inductions never want for nominations, a rolling series of endings as the city invariably changes, consuming and paving over this generation as a kind of founding myth. Mixed-use condo complexes have begun to arise to the wall’s north and south, testaments to the density of urban space that somehow manages to erase the density of substantial social connection. Or that’s one take on it, anyway, as contemporary Austin surely nurtures social networks of a different kind—newer, faster, fleeting, flashy—social connections that meet the needs of the generation that is, rather than the generation that was. In a sense, what is being invoked in end-of-Austin rhetoric is the experience of historicity itself. A theme that has recently resonated on the political right is that “this is not the America in which I grew up.” It is a truism, of course, as no one gets to grow old in the exact place that they were born. For Austin, a perennial town of student youth and musical cultures tied to youthful nightlife, the end-of-Austin rhetoric derived from this experience of coming of age in historical time. The “scene” as a particular individual knows it, then, has a shelf life that is not connected to the city as such, but joins place and psyche in a moment in time. It is, indeed, this subjective experience that is lost, that ends, rather than the city itself, but that loss is afterward projected onto the place despite the fact that that collapsed community is one of affect and not of physical real estate. But affect can take material form, as it has done in this memorial wall. It is worth a visit, a reflection, and a long, relaxed conversation with Henry. He knows the score. Jason Mellard is a lecturer with the Center for Texas Music History at Texas State University where he serves as co-editor of The Journal of Texas Music History. His Progressive Country: How the Seventies Transformed the Texan in Popular Culture is forthcoming in fall 2013 from the University of Texas Press. Those of us who were pulled by the early Austin magnetic forces were a lucky crew. How could I have known that as a 9th grader in Fort Worth, reading copies of ‘The Texas Ranger’ brought by a classmate (her older brother would leave them at their parents home on his trips back from UT). Something about the Ranger made me forsake Alfred E.Neuman and Mad Magazine for Gilbert Shelton, Tony Bell, Joe Brown, et.al. , and the Texas Ranger. After announcing to my parents that I was going to UT, regardless of their fears that it was ‘too big for a little girl like you’…off to Austin I went in 1966. The week before the fall semester began, I found the Ranger office and walked in. Several guys were in the office, laughing and talking. ‘What do you have to do to get on the Ranger?’asked the 19 year old greenhorn. ‘Can you type?’….’Yes’…..’Here, type this. You are now a Ranger’. That was the beginning of the end of my parents plans for me to be an elementary school teacher. What a lucky girl I was! I was young and Austin was wild without slogans. 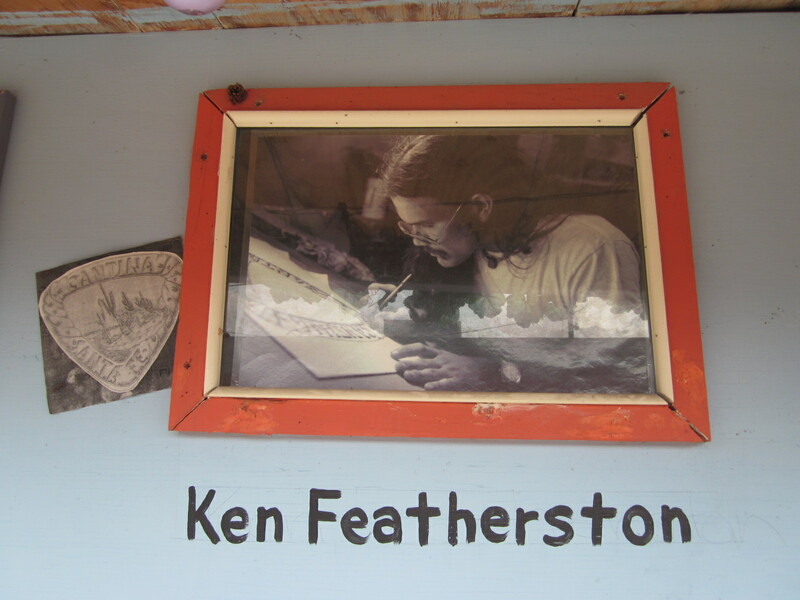 Ken Featherston was so beautiful inside and out, kind and confident, strong in his gentle ways. He was a talented artist who produced art that is still as interesting today as it was then. Thank any and all who remember this unique man. Too soon taken, even if he had lived to be 100, I feel very fortunate to have known him even briefly through my partner at the time. This entry was posted on January 10, 2013 by The End of Austin in Art, Death, Music, Nostalgia, Race and tagged Ann Richards, blues, Chicano, death, end of Austin, Issue 2, memorial, music, popular culture, University of Texas.